Are we leading to an ice age due Global warming? Thread: Are we leading to an ice age due Global warming? #1 Are we leading to an ice age due Global warming? Global warming, coming ice age, or neither? Heading for the 'Water Age'? Can global warming be real if it’s cold in the U.S.? Um… yes! KALSTER, Bad Robot and babe like this. The really interesting thing about the Arctic polar vortex over the USA is that it hasn't resulted in record cold temperatures. "The only significant thing about the cold wave is how long it has been since a cold wave of this force has hit for some portions of the country--18 years, to be specific. Prior to 1996, cold waves of this intensity occurred pretty much every 5-10 years. In the 19th century, they occurred every year or two (since 1835). Something that, unlike the cold wave, is truly unprecedented is the dry spell in California and Oregon, which is causing unprecedented winter wildfires in Northern California." Can't help you with the India data. I know I saw something on it a couple of days ago, but nothing as detailed or informative as the stuff on US and Canada. 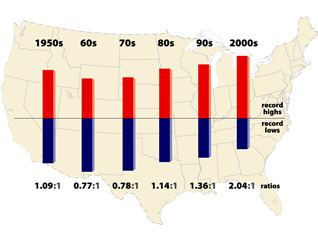 The thing to worry about with record temperatures is the ratio of record highs to record lows. afaik the US is still running at more than twice as many record highs as record lows. I haven't seen an updated version of this to include a "this decade so far" figure, but you can see the trend quite clearly. Flick Montana and sir ir r aj like this. Rajnish Kaushik, the direct answer to your question, "Are we leading to an ice age due Global warming?" is that global warming means higher temperature globally, and weird weather locally. Some of that weird weather will be cold, some otherwise. On balance we find it warming slowly year after year but what impacts people is the crazy weather events. If you only look at temperature trends of the past 50-60-70-etc... years all the way back to "the little ice age" then indeed we see a warming trend. If you look only at the last 10 years, the trend is cooler. If you look only at the temperatures from 800 ad to 1800 ad, then the trend is markedly cooling. By carefully picking your trend parameters, you can make the data support any silly claims. Always note the parameters in conjunction with any climate claims. Any truncated charts should always make you curious about the motives involved, and the data that lies beyond the parameters shown. BS if you are referring to a peer-review journal; it is better advise if it comes from a crank, non-review web site. Truncated charts in peer review journals usually have their grounding in fields outside of climatology, such as the statistical analysis used (e.g, can't take a 10 year moving average past 2008), or availability or direct observation or an effective proxy. To really find out one has to actually read the methods sections of the paper....a reasonable expectation. Even peer reviewed journals have trends and prejudices. They are all the products of imperfect humans. People do not suddenly become perfect when their words are accepted by a peer reviewed journal. The above advice doesn't loose it's value ever. And, not just for climate "science" but for all sciences. How many have ignored or refused the holocine climate optimum, or the mideival warm period, or the sudden cold snap circa 5-6kybp, and then claimed "it was only local" when confronted with the evidence? In anthropology/archaeology how many have denied the evidence which contradicts "clovis first"? How many years did it take to finally refute the V.Gordon Childe mistakes? The only good approach to science requires keeping a critical mind, and never assuming that our current trends, or commonly accepted prejudices are the ultimate "truth". If you look only at the last 10 years, the trend is cooler. Just not true. The hottest year ever recorded (going back 150 years) is 2010. Also the hottest year in the period 2002-2012. The second hottest year ever was 2005. 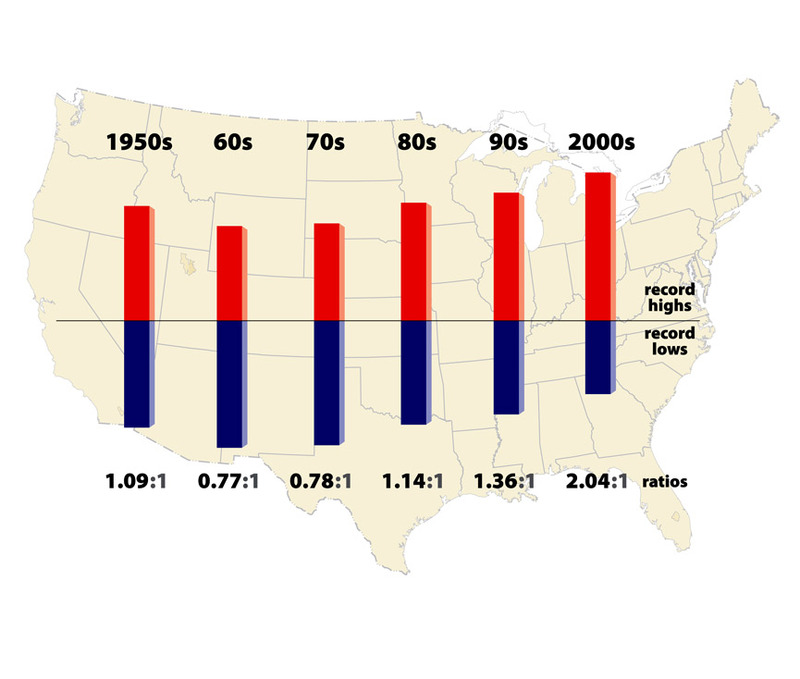 Also the second hottest year in the period 2002-2012. The trend is still hotter. Flick Montana and astromark like this. Before you go behaving like a jackass and claiming "Just not true." Take a moment and double check. You will note(to your delight?) 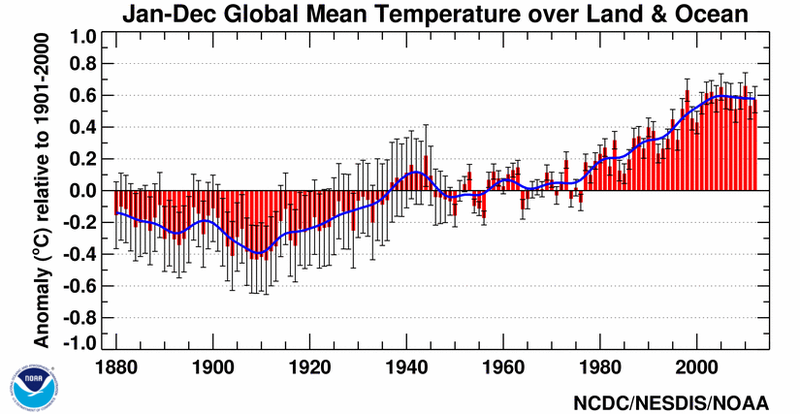 that the ncdc/noaa data also supports your claim to a hot decade. I hope we really aren't at this basic level of discussion. Are we? Where science minded people are actually going to ignore the error bars (something we should teach about 10th grade math) despite everyone involved knowing what they mean. Obviously there's been no significant change in the past ten years, one needs to cover a longer period anyhow for most climate discussions because of interannual variability. That being said we don't have to go very far to see billvon's point that the globe is significantly warmer than most of the direct observation records, including since the solar output started to decline in the late 70s. Last edited by Lynx_Fox; January 11th, 2014 at 06:43 PM. adelady and astromark like this. I posted a link to an attempt by noaa and ncdc at climate science, which you Lynx seem to be denying. careful dadio, you're on the ragged edge of climate science denial. And I commented specifically on it. I'm pretty sure you've had basic statistics at some point in your life and are well aware of how ignorant your comment about cooling was. So stop trolling. PhDemon and billvon like this. Now. That above will not appease the demanding science fact hounds.. but for me.. "They's knows of what they's do's..."
So.. are we on the brink of a ice age.. ? No. It does not look like that is true. I return to just clarify that I am/was the ships electrician. Last edited by astromark; February 7th, 2014 at 01:49 AM. ~ and a quick and very little research would reveal that many coastal areas globally were subjected to king tides as this last new moon co in sided with Lunar para gee.. gee wiz.. Calm down and carry on..
are you suggesting that werewolves cause floods by howling at the moon ?
" Where are the werewolves is as where are the K9's subset wolves that seem to howl at a deaf moon.. or is this a territorial and matting habit of the wolf. A barking madness is apparent while we howl at the Moon.. Low barometric pressure coinciding with king tides... Awooo... woof, woof Yea-Right." and that it's happened before and will again. Global warming is more about the weather patterns becoming less stable, containing more energy and about being less predictable. If you use Chaos Theory or Complex Systems Theory to model the changes you get a period of strange behaviour as the systems degrade into wild turbulence. Out of the turbulence a new period of stability emerges. Unfortunately it is impossible to predict what the new stable state of the system will be although it is possible to calculate a set of possibilities. Not really true and it's very much a mixed bag. Broadly we can consider the tropics and extra-tropics. The tropics will probably become less stable and more energetic because much of their energy is convectively driven. Extra tropical systems are likely to become LESS energetic because most of the energy source is from latitudinal gradient which will decrease as the high latitudes warm up faster than the tropics. Overall rain patterns, monsoonal strengths etc are already shifting as sub-tropical jet is reaching higher latitudes. As for predictability, most of it will be less, BUT only because long term weather records temperatures, precipitations and secondary effects such as soil moisture, flooding potential, a heat wave etc are being rewritten. There will also be some dramatic changes in a few places--Mediterranean and Brazilian Hurricanes (predicted) for example. If you use Chaos Theory or Complex Systems Theory to model the changes you get a period of strange behaviour as the systems degrade into wild turbulence. Out of the turbulence a new period of stability emerges. We can't say this with any certainty either--the models don't really suggest entirely new climate stable regimes. The TAR was 12 years ago! There's been a lot of work done since then. Just looking at hurricanes/cyclones/typhoons we seem to be converging - for the time being at least - on a projection that there may be the same number or fewer of these storms over the next few decades but that the proportion of large, severe and/or extremely damaging storms will increase, probably markedly. One thing for everyone to ponder about. Hurricane Sandy was not a severe storm by the standard measures, but it was much, much larger and more damaging than previous storms. As for longer term predictions, all we have to go by is physics. The more CO2 in the atmosphere, the hotter it gets, more ice will melt, ocean waters will expand, sea level will rise in most places, wet regions will get wetter, dry regions will get drier, the more acidic the ocean gets, the more reefs and fish will decline. Whether this means that the number and severity of storms will increase or decrease during which stages of increasing temperature and declining differences between equator and poles - we don't yet know. And most people think we'd be better off not knowing. Because the likely impacts on agriculture are not user friendly. "all we have to go by is physics." Picking on this phrase: in a warmer world, extratropical cyclogenesis will be reduced with lowered latitudinal temperature gradients (and weaker polar jet streams). Outside of the tropics, with the unique exception of perhaps directly along warm water current coast lines (e.g. off Eastern coast of US), where there will be a bit more latent heat available to compensate, extratropical storms will be less frequent and of lower intensity-it is very well established science. Last edited by Lynx_Fox; February 9th, 2014 at 07:00 PM. Last edited by kojax; February 9th, 2014 at 12:40 PM. There's too much attention to temperatures on land, which are not really as relevant as temperatures in water. One of water's greatest traits is THERMAL CONDUCTIVITY. If the world were indeed warming, the water in the oceans would complicate the process. (And remember there is more of the Earth's surface covered by water than covered by land.) Some heat would be lost by way of water becoming moisture in the air. Some would be lost by melting of ice. The heat gets trapped, or moved, or absorbed in different ways. The water acts toward heat a lot like how a battery acts toward electricity. Just because the electric charge isn't going up doesn't mean there isn't more electricity.It could be that the battery is simply consuming it as it charges. Conversely, if the temperature of the Earth were dropping, and new ice were forming in the oceans, the freezing water would absorb heat (to make the crystal bonds), making it seem like summer all around. 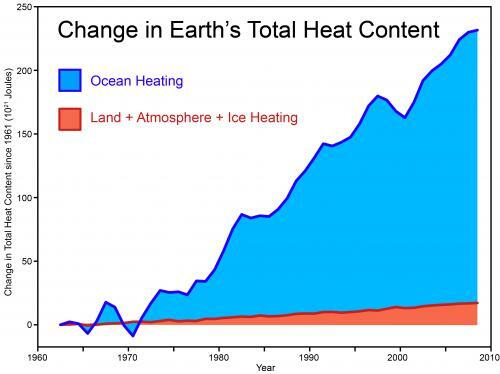 Well, there's no doubt about the oceans warming. The "complication" is simply that people don't perceive it. As for predictability, most of it will be less, BUT only because long term weather records temperatures, precipitations and secondary effects such as soil moisture, flooding potential, a heat wave etc are being rewritten. anyone with a smattering of understanding as to how statistics work will tell you that prediction using a certain data set will become fraught with uncertainty the further you step away from that data set, and that's exactly what's happening now : how can you deduce that something is a once-a-century event based on records that go no more than a few centuries back ? But that's only true for data sets that are data only - like financial statistics. When you're dealing with climate data, you're doing it within tightly defined physical limits. Radiative physics, fluid dynamics and all the rest make climate much more predictable than say the stock market or even weather which relies far too much on the completeness of an original state. Whereas with climate, you can write all the physics equations into a model, set it going with no initial conditions stipulated apart from global geography and without any further prompting it comes up with an unpredictable ENSO regime and monsoons and trade winds and heat transport to the poles and all the features we recognise in our climate. Regardless of any reader's interest or skill in statistics, this comic linked by one of the comments at Tamino's is pretty good. But that's only true for data sets that are data only - like financial statistics. When you're dealing with climate data, you're doing it within tightly defined physical limits. it still begs the question how you assess whether a change in frequency of rare events is a real change or just a reflection of the fact that rare events don't have to be spread evenly in time ? Got a quote for flood insurance of $5600/year. (based on the most "current" 1980s FEMA map that hasn't been updated, don't include the knoll or the 20' elevation of the house). They not only care, BUT ARE REQUIRED to provide federally insured flood insurance at a set price--in the example above for nearly the same as the monthly payment (the insurer cannot lower the premium regardless of their particular analysis or failure of FEMA to update their badly outdated maps--owner can pay $1000+ to engineers to do an independent analysis of the particular house elevation and fight the FEMA paperwork machine). Yes and no. It's not very hard to estimate current risk from even as short as a seven to ten year data record using standard statistical techniques to figure out the sort of distribution and variance (including for each tail). Of course 30+ years is best, as is comparing and integrating analysis for nearby stations with longer records. Models of course significantly improve those estimates as well. Of course with things changing dramatically with regard to temperature, moisture content of storms, and in the flooding example, land use (e.g. forestry practices, urban development and renewal of pastures to woodlands), standard methods break down. And of course, to no ones surprises, we increasingly have to turn to climate, weather and hydrology models to bound the solutions and better assess risk. Where I currently live is going through borderline public disobedience right now as FEMA has been starting to update their maps and based on actual science, better land topology, and model projections is now telling homeowners and insurance companies that beautiful 1930's victorian homes that have never been flooded are now in high risk flood areas and going to require flood insurance costing up to $10K a year and effectively devalue them by tens of thousands as a result. (the public meetings are down right hostile--with extra cops at the door etc). I think such impacts are going to become all too common over the next few decades of man-made climate change. Probably most of the effort in this direction is various attribution studies looking at specific events. Things like running a set of models for a particular storm, (e.g. Sandy), under observed conditions and running another set under prior conditions when there would have been less latent heat available for the storm. Compare the two to get an idea of how Sandy's might have been different now than in the past, or as you suggest and perhaps more importantly try to figure out whether Sandy like storms are going to become more frequent (a once a decade event rather than a 1 in hundred years one). From what I've seen though--attribution studies seem to confuse the public rather than helping educate them. Long delays for the research, failure to put such studies in simple language for the public, reluctance of scientist to engage and the public's deep reluctance to hear bad news make it a hard story to tell/sell. Last edited by Lynx_Fox; February 10th, 2014 at 03:33 PM. Hah! Munich Re - the ginormous reinsurance company - are extremely proud of the fact that they were the first organisation in the world to identify the effects of global warming. They picked up a trend of increasing flood events ..... in 1973! Hah! Munich Re - the ginormous reinsurance company - are extremely proud of the fact that they were the first organisation in the world to identify the effects of global warming. Wonder no more. Practically all houses in Miami are uninsurable on normal actuarial basis and have been for years. That's why you USAnians have your deeply strange government guarantees/ subsidies/ props for policy holders and insurance companies in relation to floods. Real-estate and business leaders have claimed there could be a potentially cataclysmic hit to the state’s real-estate market as rates go up because of changes approved in the federal 2012 Biggert-Waters Flood Insurance Reform Act.